Amazon Launchpad hub to find companies that share your passion about building great products and get the services you need, at all stages of your product life cycle. 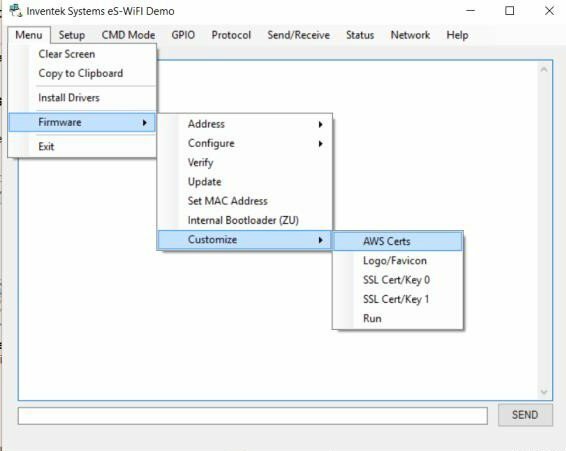 Application Note below on how to connect to AWS using eS-Wifi modules and IWIN AT commands. 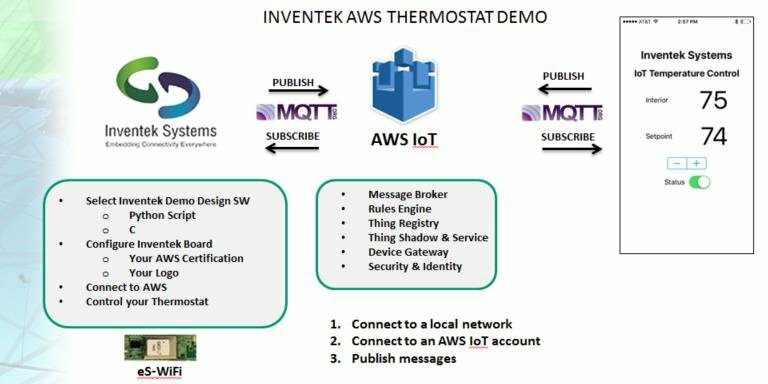 The Amazon AWS IoT service enables secure, bidirectional communication between IoT devices, sometimes referred to as Internet-connected things or simply things (sensors, actuators, devices, applications, etc. ), and the cloud over MQTT. Things are authenticated using AWS IoT service-provided X.509 certificates. Once a certificate is provisioned and activated it can be installed on a thing. The thing will then use that certificate to send all requests to AWS MQTT. Authorization is controlled by JSON policy files that allow you to specify which resources a specific device (certificate) may access. 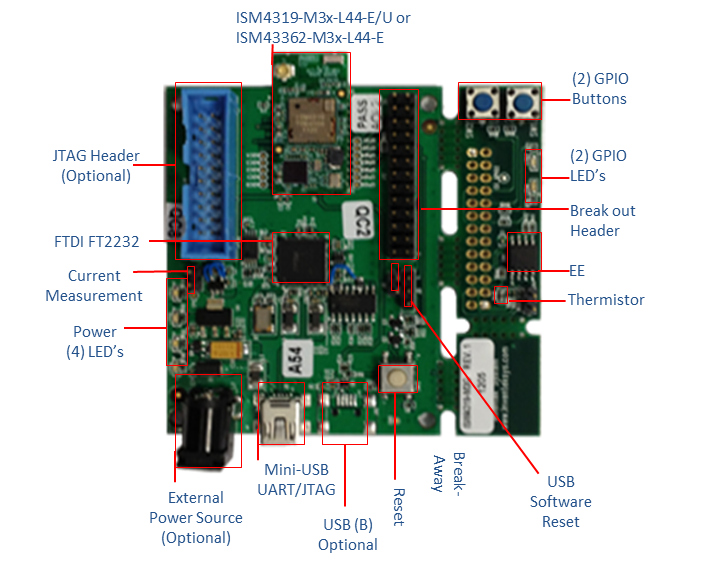 Inventek’s eS-WiFi Demo program incorporates a firmware customization feature to program the required certificated on a device. Go to the AWS IoT service by clicking on or entering https://aws.amazon.com/iot/ in a browser. Sign in to the AWS Management Console by clicking on or navigating to https://aws.amazon.com/console/ and then clicking on Sign in to the AWS Console. 8. Click View thing in order to connect a device. 9. Click Connect a Device. 10. Click Embedded C as the supported SDK and then click Generate Certificate and Policy. 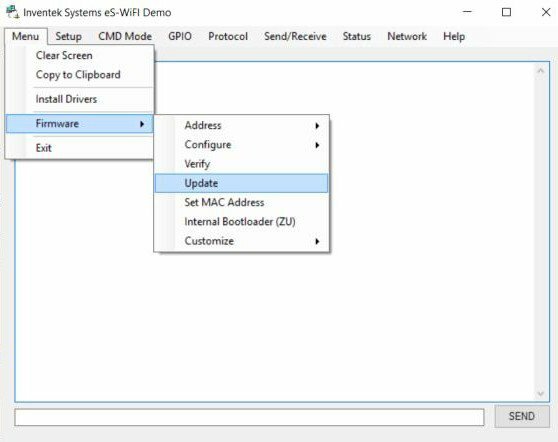 The eS-WiFi demo program will automatically create a new firmware image that you can use to re-flash your evaluation board. 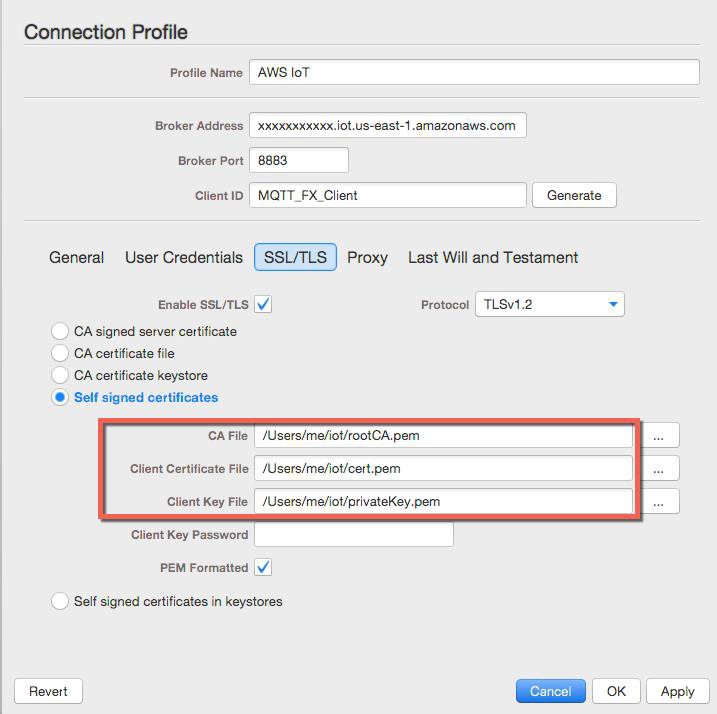 Now that you have an AWS account and the eS-WiFi module has been updated with your account credentials, this section shows you how to connect to the AWS cloud using either a Python Script or “C” code”. 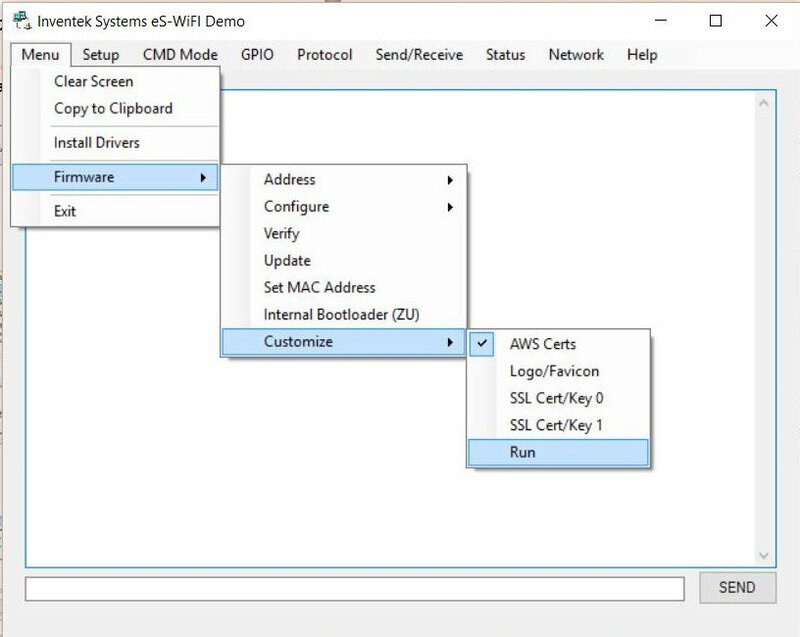 Download the IWIN AWS Thermostat Demo Python script to your PC. On the Inventek ISM43362 or ISM43340 evaluation boards there is a Thermistor and two blue GPIO Buttons that are used by the Python script. The demo will connect you to the Amazon AWS cloud, and present the temperature as well as your last set points for the Thermostat. Using AWS shadow you can see temperature and current thermostat settings. For real time viewing of data on the AWS cloud use the MQTT client detailed below. At this point you have completed your basic connection to the Amazon AWS cloud. You have connected your Thermostat to the Amazon cloud and published some basic GPIO controls as well as Temperature. The next step is to work on creating your controls and database using the AWS tools available. 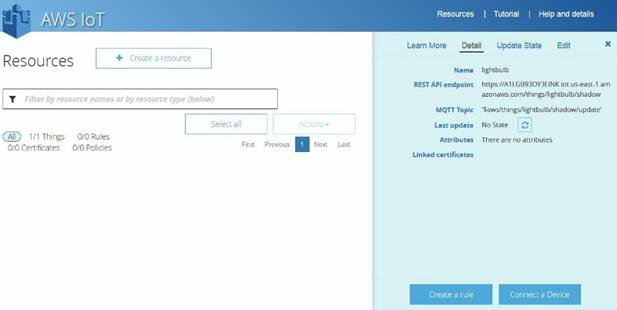 The steps in this section show you how to verify you can use your certificate to communicate with AWS IoT over MQTT. 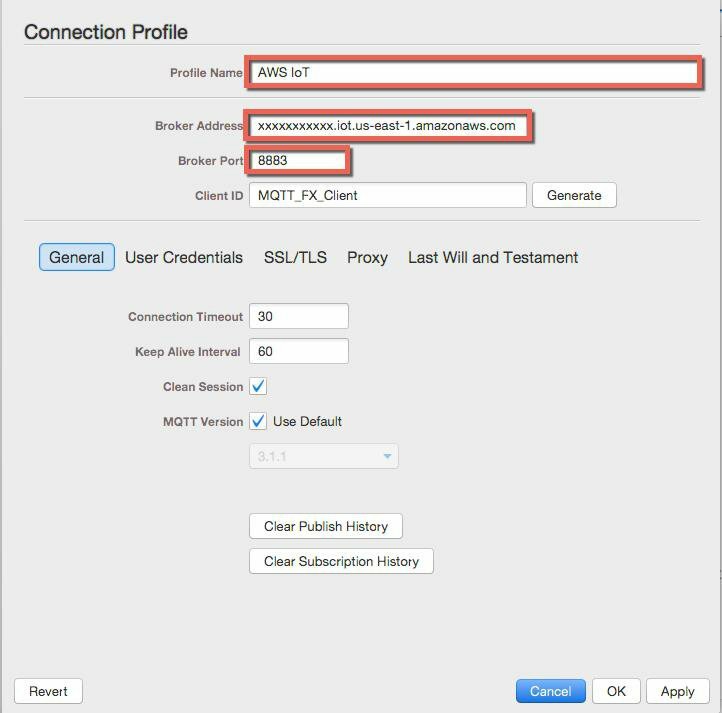 You will use an MQTT client to subscribe and publish to an MQTT topic. 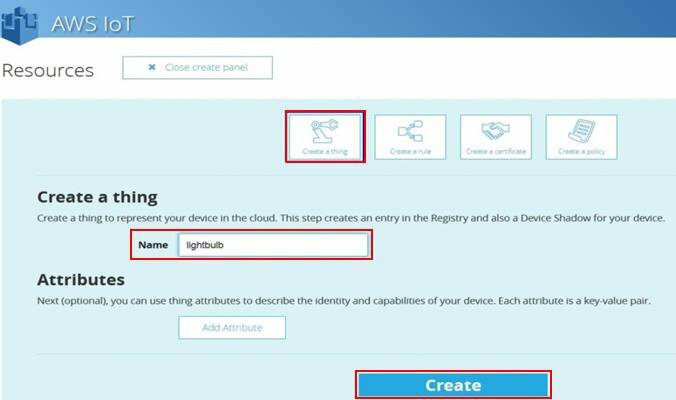 To configure MQTT.fx, open the app and choose the gear icon at the top of the page. Choose the OK to save your settings, and then choose Connect to connect to AWS IoT. Choose Subscribe and the Subscribe page will be displayed. Type my/topic in the text box, from the drop-down list, select QoS 0, and then choose Subscribe. Choose the Publish link and the publish page will be displayed. Type my/topic in the text box, and then type some text in the message area. From the drop-down box, choose QoS 0, and then choose Publish. Choose Subscribe to display the Subscribe page. You should see the message has been received.